Beached Sea lions are turning up on California's central coast with domoic acid poisoning, an affliction associated with marine algae blooms. The Marine Mammal Center in Sausalito has admitted 68 sea lions into its veterinary hospital since July 1st. “That many animals in such a pretty short time period is a severe event,” says Cara Field, staff veterinarian at the Center. Domoic acid is a neurotoxin, which is a byproduct of algae blooms that crop up in coastal marine waters throughout the year, especially during the summer months. The noxious compounds are eaten by anchovies and sardines which are then consumed by sea lions and other marine mammals. The symptoms of poisoning are neurological, including tremors and convulsions, which can affect immediate survival or cause long-term brain damage. There is a cascading effect of this poisoning in the sea lion community, explains Field, because most of the animals currently affected are lactating mothers with offspring that are dependent on them. Fortunately, sea lions are not an at-risk species and Field says their populations are stable. The number of affected sea lions is up since last year. A total of 89 animals have been treated so far this year, compared with 70 last year. However, in years with the biggest algae blooms, such as 2014-2015, numbers of affected animals were well above 200. 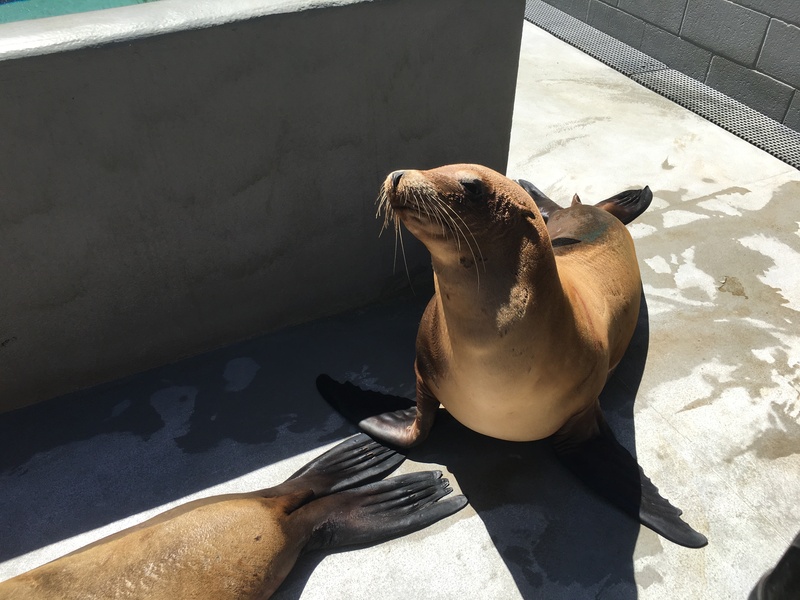 The Marine Mammal Center started tracking sea lion domoic acid poisoning in 1998, and since then, has seen these events evolve from being a summer-only problem, to a year-round one. Afflicted sea lions often display abnormal behaviors including head waving and wobbling, disorientation and a general lack of responsiveness. 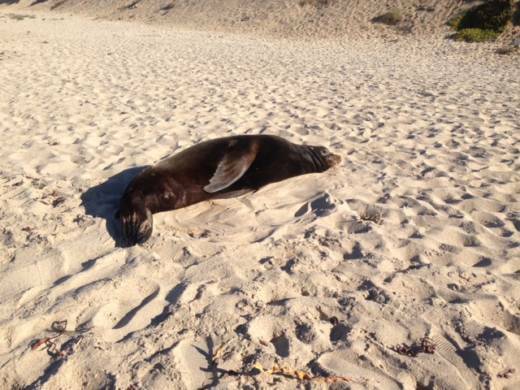 If you see a sea lion on the beach, Field advises you not to approach it. Instead call the center’s 24-hour hotline. July was a busy month for the hotline. Some days, up to 10 sea lions were reported, many from San Luis Obispo County. “Our rescue teams were in that area working all day and all night, collecting animals and bringing them in for treatment,” says Field. Once animals are brought to the center, they are treated with anti-seizure medicine and given time to recover. Along the northern California coast, the primary cause of marine algae blooms are natural factors such as ocean upwelling of nutrient-rich water combined with warm ocean temperatures. Blooms are also fed by polluted runoff from agriculture and other human activity, and are projected to increase in frequency and severity due to climate change. Other animals such as dolphins, Guadalupe fur seals, northern fur seals and southern sea otters are also affected by the toxin.